Have you ever thought about being President of the United States? There are good things and bad things about the job. One good thing is you get to live in a giant house with a movie theater, swimming pool, and even a bowling alley! But on the other hand, sometimes people don't like Presidents. Once, somebody was so angry he threw a cabbage at President William Howard Taft. Are you smart enough to be President? Thomas Jefferson was an expert on politics, law, music, geography, and more--plus he played the violin, founded the University of Virginia, and designed his own mansion. But nine Presidents never even went to college, including Abraham Lincoln. Andrew Johnson didn't even know how to write until after he was married! 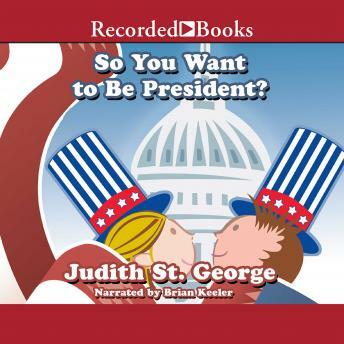 Award-winning author Judith St. George's book is a humorous and informative look at America's highest office. Learning about the Presidents has never been more entertaining than with Brian Keeler's lively narration.